Secure data. Crazy fast. Insanely easy. HashIt is a desktop app that takes your list of data and converts each line to a MD5 hash. Just drag, drop and click. It's that easy. HashIt is available for either OS X or Windows for only $40. Watch how fast and easy HashIt is to use. HashIt is insanely easy to use and extremely fast. First, drag and drop your mailing list text file onto the HashIt application window. Next, click 'Hash It!' It really is that easy. HashIt automatically removes spaces and converts all characters to lowercase before creating MD5 hashes. Why should you use hashit? Don't spend hours fishing around online for tutorials on how to do it yourself. We've done the heavy lifting for you. 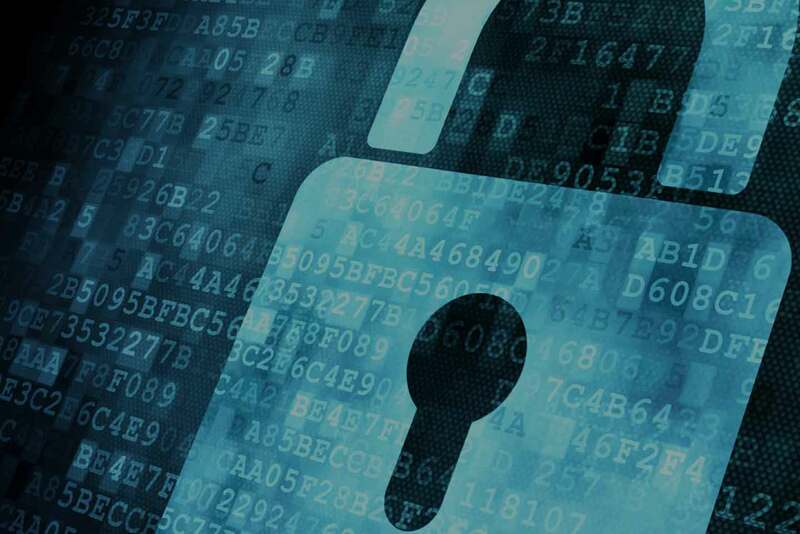 Use HashIt to convert your list's data into secure MD5 hashes in a flash. Before you upload your email list to a 3rd party, your email addresses should be converted to secure MD5 hashes for security purposes. 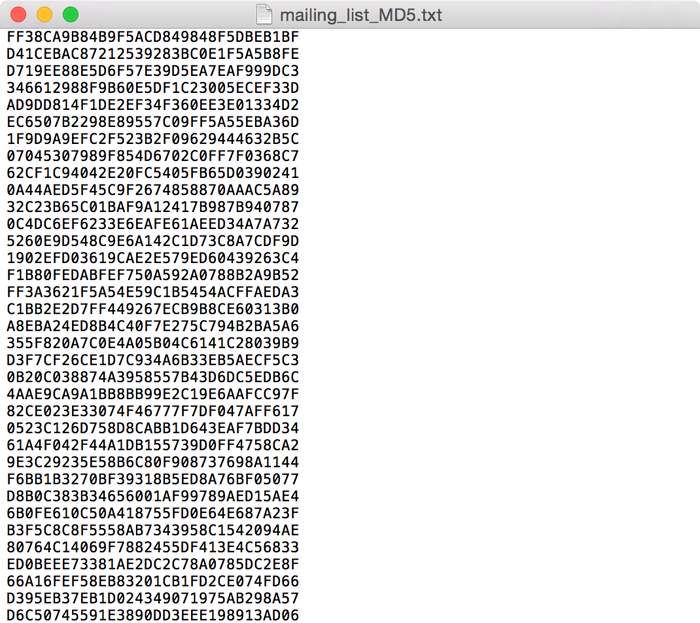 HashIt normalizes and creates an MD5 hash of every email address in your list. HashIt makes sharing your email list safe and secure. 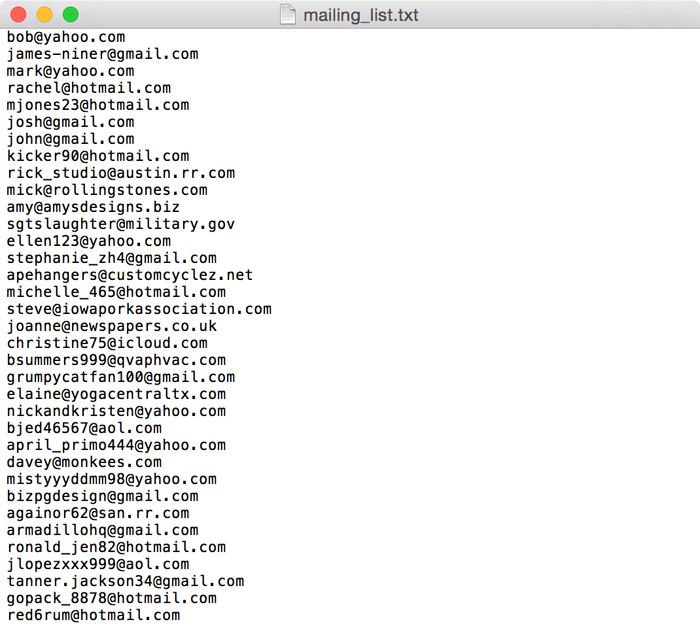 MD5 your entire list of email addresses. Take the hassle out of converting your email addresses to MD5 with just a click. HashIt is not a subscription service. You pay $40 and it's yours. Forever. Runs locally on your Mac or PC. Your credit card payment will be processed by PayPal, the leader in online payments. After your payment is processed, you will receive an automated email with a License Key for immediate use of HashIt. If you are not completely satisfied with HashIt, you may contact us within 30 days of purchase letting us know why you are disappointed and we will gladly issue a refund. We want you to be happy. Plain and simple. HashIt takes each line of your list and converts it into an MD5 hash. But before it does that, HashIt "normalizes" the data in your list. This means that it removes all spaces and converts all characters to lowercase before creating the MD5 hash. Does it work on a Mac and a PC? Why yes, yes it does! We have a version of HashIt for both OS X and Windows. HashIt works the same on both platforms. How should my list be formatted? A single column .txt or .csv file with one record per line and containing only the data that you want hashed. I'd recommend no delimiters and no header row. Where is my list saved? It gets automatically saved in the same location as your original list, and it appends "_MD5" to the end of the filename. For example, if your list is saved on your desktop as "my_list.txt" HASHIT will save your list of MD5 hashes as "my_list_MD5.txt" on your desktop. Can I use HashIt on more than one computer? No. Your HashIt license is hardware-specific. It will not work if you try to install a single license on more than one computer. If you need a copy of HashIt on more than one computer, you'll need to buy a license for each computer.